FREE SHIPPING on All Orders | 1 YEAR Satisfaction Guaranteed! high-profile places like Walgreen’s, and many others with instructions on how to do it yourself. And it’s easy to see why that idea is so attractive: You replace the only part of the cartridge that’s spent, and pay only a fraction of the price you’d spend on a full replacement. What could possibly be wrong with the setup? Well for one thing, HP reps told me last week that, at least with their products, it doesn’t work. I know what you’re thinking. “That’s exactly what you’d expect people to say if they work for one of the largest printer manufacturers in the world.” To which I can only reply: Uh, yeah, you’re right. A company in HP’s position has every reason to downplay this cost-cutting measure, so anything you hear about it from someone at the company itself deservedly needs to be taken with a grain of salt. I couldn’t agree more. In fact, I brought my shaker from the kitchen and put it right next to the computer. While I was touring in cartridge recycling plant, during the typical dog-and-pony presentation before the main event, the subject came up and our guides were remarkably willing to discuss (and defend) their position when we seemed (at first, anyway) to be more interested in that than in the actual recycling process we’d been invited to witness. How does the quality change, I wondered? “Because the print heads or the nozzles on the print cartridge,” she said, “after you’ve used them until the ink is gone in the cartridge, the quality of those change. 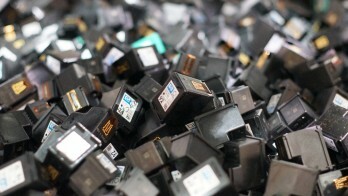 They’re not going to print necessarily the same way as they did for the first run.” Gingras then touted an HP-commissioned study of business customers that showed reprinting inspired by the resulting poor quality offset the environmental savings of reusing or remanufacturing that cartridge. This article was published on Tuesday 26 January, 2016.